Trendy Hackney has been transformed from a no-go area to a borough bursting with vibrant neighbourhoods. Rentify can help you make the most of your letting with our handy borough guide. At Rentify we have property specialists dedicated to Hackney, armed with local expertise and unmatched valuation knowledge to find you the right tenants. The London Borough of Hackney has come a long way from its insalubrious past and is now one of the most popular and vibrant areas of London. Fashionable Stoke Newington is a favourite among young families, whereas Shoreditch and Dalston are the stomping grounds of choice for young professionals and creative types. Tenants flock to Hackney for the trendy bars, cafes and restaurants that have sprung up around the borough, and there’s a strong art and music scene. Victoria Park offers vast green space for Hackney’s residents, and plays host to numerous festivals in the summer months. Though the tube doesn’t extend to Hackney, numerous London Overground station make the borough accessible to the rest of London. Housing stock in Hackney is comprised primarily of flats, with a mix of local authority blocks and modern new build residences. Victorian terraces can also be found across the borough. Hackney's many districts each have their own character, catering to a variety of residents. Here's our top picks for new landlords in the area. 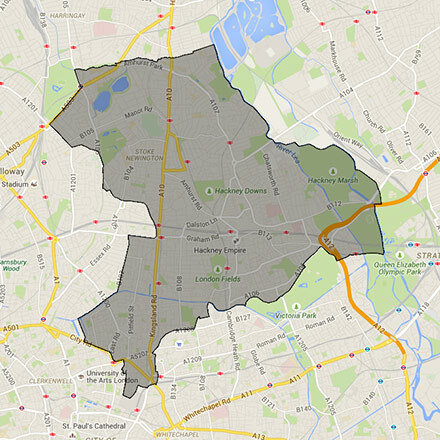 This borough covers the E1, E10, E15, E2, E20, E5, E8, E9, EC1, EC2, N1, N15, N16, N and N5 postcodes. Rentify uses proprietary methodology for data collection and processing. Borough data is collected from Rentify's property database and external public sources.